GET OUTSIDE! Ottawa Magazine presents our annual SUMMER issue, featuring 47 fun ideas for enjoying the city during the summer months. In this issue we asked our food insiders to create their ultimate picnic spread - the results are an ode to summer eats. 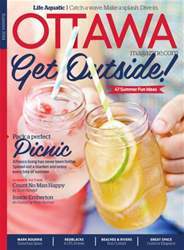 Plus top summer songs, a foodie's guide to farmers' markets, cute summer clothes, bestselling books, and more. Local waters are explored in a variety of ways, from Ron Corbett's examination of water-quality issues to our water-sports pack featuring stunning photography and plenty of tips to get you out on the water. Summer Fiction also returns with a SCOTT RANDALL story on car-pooling and retirement from the public service. As well as an excerpt from EMBERTON, the debut novel by PETER NORMAN.